The Laser Turret defends the area from enemies with damaging lasers. The Laser Turret is crafted from steel plates, a steel frame, a Power Supply Unit, a diamond, and an emerald. 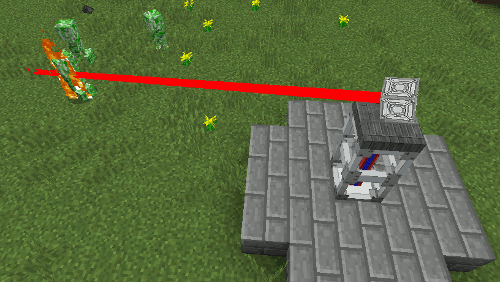 The Laser Turret shoots a laser at monsters that get too close. If the player placing the laser is on a scoreboard team, then the Laser Turret will also shoot other platers who are not on the same team. The laser beams penetrate through the target, hitting anyone in the line of fire, so be careful. Each laser blast uses a lot of electricity. 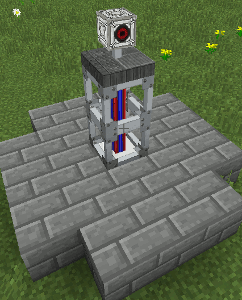 To sustain fire, you will need a battery array with several batteries.